If you are an organization using G Suite (formally Google Apps) you can centrally create and manage your users’ email signature within the Google Admin console. This will ensure every user automatically has the same email signature when sending emails via G Suite from all mail clients. 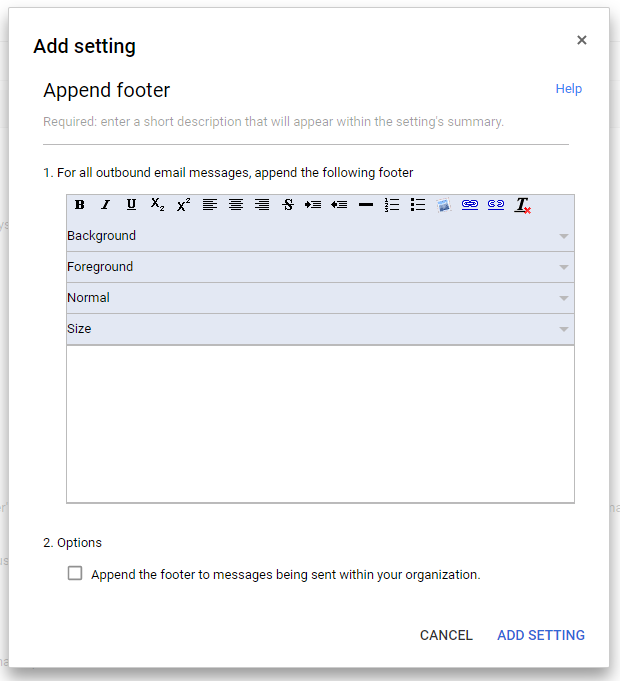 Check out this step-by-step guide to setting up an organizational G Suite email signature. 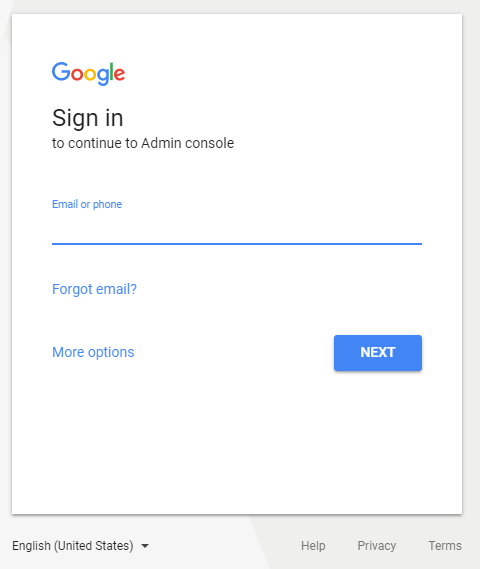 Login to the Google Admin console at https://admin.google.com using your Super Admin credentials. Select Apps from the console. You’ll be taken to the Apps settings page, select G Suite. Choose if you want the signature to apply to all organizational units, or for specific organizational units. 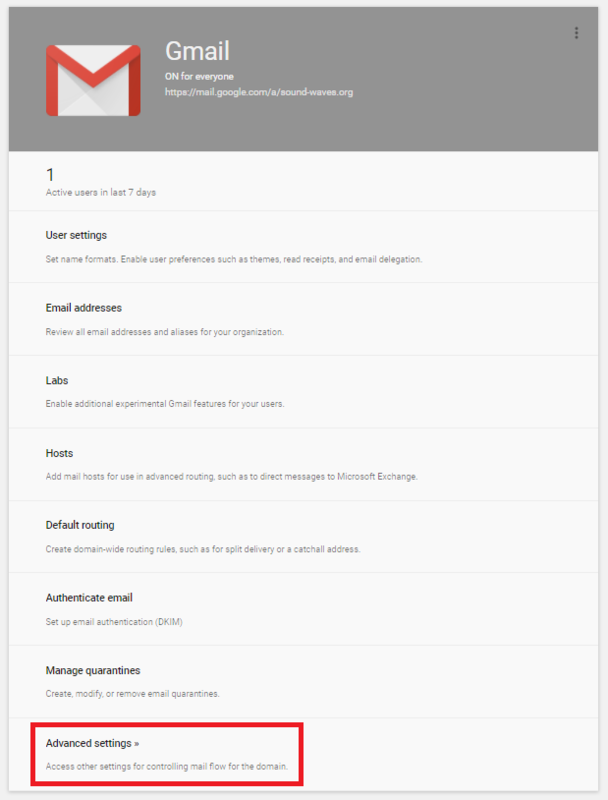 Select Gmail from the Services list. Within the General Settings tab, scroll to the Compliance section and hover over Append footer, click CONFIGURE. This will open an Add setting window. Enter a description for the signature and either paste in your design or create one in the designer. 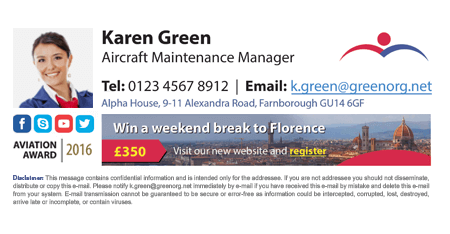 Note: There is a 10,000-character limit (HTML code is included). 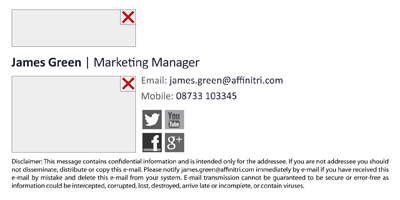 You can choose if the signature will also appear on internal emails. Note: This signature will apply to all users in your selected organizational unit, you will not be able not personalize the signature with user contact information, so it’s best to keep the signature generic. Once you’re happy, click ADD SETTING and scroll to the bottom of the Advanced settings page and click SAVE. Your company’s new G Suite email signature has now been created! When using this method, the G Suite email signature you create will appear at the bottom of the email thread instead of under every reply. To create a separate reply signature, you will need to use Canned Responses. G Suite users will have to set these up themselves within the Gmail settings. Want to make more out of email signatures in G Suite? No ability to pull users’ contact details from Google Directory. Can only create one signature for an organizational unit, and not individuals or departments. Signatures are added at the bottom of the email chain. Cannot see the signature when composing an email in Gmail. For an easy way to create HTML, dynamic corporate G Suite email signatures for individuals, departments or the whole organization, try Exclaimer Cloud - Signatures for G Suite.